Home » All Posts » Why I killed the bunny logo. Why I killed the bunny logo. The business guru’s say build your business, the way you want, and do your thing. To me that means NO restriction on the safe ingredients I use (in terms of the origin of the ingredient or world-view). I’m not after any certifications. Maybe I’ll make up my own seal for certified, conventional, and un-organic. Freedom is why I left the corporate world. To avoid being dictated to by some organization who boxes me in with their “approved” list of ingredients. Screw that crap. With ~10,000 hours of cosmetic formulating under my belt I don’t need those restrictions. I also don’t value an organization who wants to hold the world to 100 year old agricultural techniques, or won’t accept biotechnology. Easy to have that frame of mind when you have a full belly, but there are other people in the world that need to eat besides the privileged food elitists. I’m not gonna “pay to play” to have an organization make me look green/wholesome/eco/cruelty-free for a price. That brings me to animal testing. I always have to smile when I see “no animal testing”. It’s supposed to make you feel all warm and fuzzy, but I find it disingenuous because of the implication that all the makers who haven’t paid for the seal are cruel. The dirty work has already been done. It’s one of the reasons why I don’t have the leaping bunny on my site. I think it’s a fine organization and applaud what they do to help outlaw animal testing on cosmetics (according to what I’ve read, animal testing has been pretty much phased out since the 90’s anyway, except for some big conglomerates who want to tap into the China market). I can’t imagine using animals to test frivolous things like cosmetics. They aren’t necessary to our survival. From what I understand, certification only pertains to new testing. Virtually every ingredient we use has been tested on animals in the past. 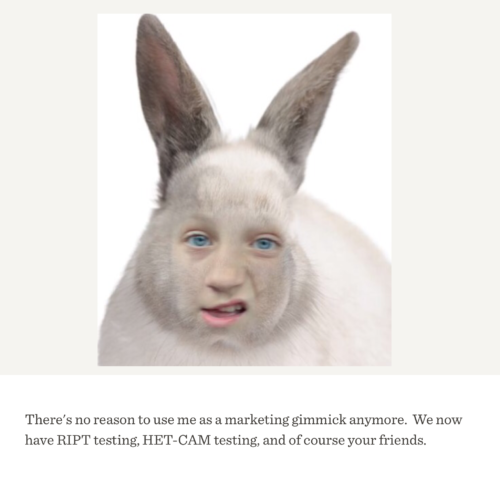 On the Leaping Bunny site it says: “Some companies choose not to join our program because they continue to conduct or commission animal tests for ingredients or formulations, or they wish to reserve the right to test on animals in the future” This is so NOT applicable for small companies or solopreneurs! Hello? ding-dong, We’re not Avon or L’oreal! “We don’t test on animals”. Of course you don’t. How would you? It’s like me saying I don’t put plutonium in my cream. (I’ve tried to locate labs that perform animal testing to no avail; I wanted to find the cost of Draize testing for something small companies weren’t going to do anyway). Does that mean you didn’t rub Fido’s eyes with shampoo or didn’t spend thousands on testing? Or you did the legwork to get certs from your suppliers that they don’t currently test on animals. The dirty work has already been done! There’s no need for suppliers to repeat it. The unrestricted use of these phrases by cosmetic companies is possible because there are no legal definitions for these terms. A cosmetic manufacturer might only use those raw materials and base their “cruelty-free” claims on the fact that the materials or products are not “currently” tested on animals. I don’t know of any small company that has the funds or desire or need to do animal testing. For all practical purposes, everyone is cruelty free. Anyone can put a statement on their site and claim that they are ‘cruelty free’. Ya know what would be a better spend of money? Ditch the seal and donate to your local animal shelter. Wow- you have some really interesting points and you have given me lots to think about. I love your spirit and humor. Thank you Claire. Love your feed-back and coming from you means a lot!